UW–Madison Archives, 9/11/13/1 Box 1. Image used with permission of Phillip Lithographing Co. The cows were blind, their growth was stunted, and their calves were born dead. The scientists feeding them didn’t know why. These unfortunate cows were part of a cutting-edge nutrition experiment, fed carefully measured diets that provided the right amount of protein, carbohydrate, and fat. Their balanced diet was derived only from wheat. 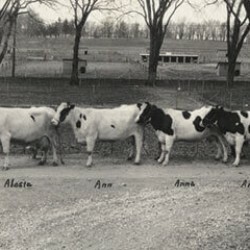 Across the barn, cows that ate the same diet, but derived from corn, were completely healthy. This nutritional mystery unfolding in the barns at the University of Wisconsin’s College of Agriculture in 1907 took six years to solve. Researchers discovered that certain type of fats, from milk or eggs, helped animals grow, while fats from lard or olive oil left them stunted. 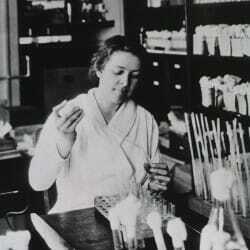 From that milk fat, one hundred years ago, researchers isolated the first vitamin, A. This discovery, and the research methods it pioneered, pushed nutritional science into the modern era, kicking off a decade of intense study of what we eat and why. 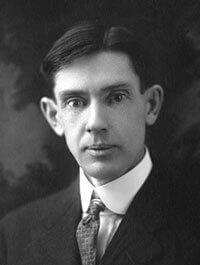 The leader of American nutritional chemistry, Elmer Vernon McCollum, actually owed his life to vitamins. While we all owe our lives to vitamins, McCollum had firsthand experience with the vitamin deficiencies he studied. When he was seven months old, his mother found herself pregnant again and had to wean him, feeding him through the winter on boiled milk and mashed potatoes. After a few months, he fell ill, suffering from sores on his skin, swollen joints, and bleeding gums. In 1880, no one knew what was wrong with him. The child was dying, slowly, mysteriously, until one day, while his mother was peeling apples, he began sucking on the scraps. The next day, he seemed a bit better, so she fed him apple peels for days as he regained his strength. When spring arrived, she fed him other fruits and vegetables, and he recovered completely. What his mother didn’t know, and McCollum himself didn’t figure out until many years later, was that he’d almost died from scurvy — a deficiency of vitamin C, scientists would later discover. Boiling a food, as McCollum’s mother did to his milk, destroys the vitamin C.
McCollum didn’t remember his own skirmish with scurvy, but he grew up hearing the story of the apple peels that somehow saved his life. Perhaps it motivated him to study the chemistry of nutrition. He eventually graduated from Yale and moved to Madison to take a position as an assistant professor of chemistry. The sick, blind cows were waiting for him, and Wisconsin’s farmers were waiting for answers. In 1910, when McCollum moved to Madison, the cutting edge of nutritional chemistry was “purified food” — processing foods to measure the exact amounts of protein, carbohydrate, and fat. Scientists thought they had found all of the building blocks for a healthy diet, and they focused on finding the optimum amount of each. But the stunted, blind cows in the barns in Madison clearly demonstrated that diet wasn’t that simple. Something important was missing. Cows are not ideal animals for nutrition experiments. They have large appetites, slow growth, and slow reproduction. McCollum’s first great idea was to study nutrition using lab rats instead. According to his memoir, most of the faculty thought the idea was silly, since bovines were literally the cash cow of the state’s economy, but his boss agreed to let McCollum feed and breed white rats in his spare time. Fed on the processed, “purified” diets, the rats failed to thrive. The process-of-elimination experiments conducted to find what their diet was lacking took a lot of time. Luckily, a young woman named Marguerite Davis showed up on campus, looking to volunteer. A college graduate with a degree in home economics — like many ladies of her generation — she had moved to Madison to keep house for her English-professor father and was looking for an intellectual outlet. McCollum happily put her to work caring for and feeding the rats, and keeping careful notes on the process. McCollum and Davis found their first clue in 1912. They tested rats on three different fats — milk, olive oil, and lard. The milk-fed rats continued to grow and thrive, while the rats receiving olive oil or lard started out well, but then stopped growing, becoming sick and stunted. The news that milk fat appeared to have protective power over the health of rats was greeted enthusiastically by McCollum’s boss, Stephen Babcock. In America’s Dairyland, any research that demonstrated the benefits of milk was worth pursuing. The weird little rat colony just might pay off, it seemed. Another pair of nutrition scientists, professors who taught McCollum while he was at Yale, published a paper demonstrating that their rats thrived on a diet that included protein-free milk, also known as whey. This was further evidence that the magical ingredient was in the milk. To prove that the growth-promoting nutrient was real, McCollum and Davis used a chemical technique to extract the fat-soluble compounds from milkfat. Then, they mixed the extract into olive oil and into lard. Rats that ate the treated olive oil or lard grew to be just as healthy and happy as the rats that drank the milk. This finding was proof that the growth-promoting nutrient was real, and the Wisconsin researchers published their official discovery in summer 1913. But, like many discoveries, this answer just raised more questions. No non-human animals drink milk after they are weaned, but they grow and thrive on their natural diets nonetheless. Milk couldn’t be the only source of the newly discovered nutrient, which McCollum was calling the fat-soluble factor. It wasn’t found in grains; it wasn’t found in meat. McCollum and Davis found it in egg yolks, but most animals don’t eat those either. Experimenting with plants, they found that extracts of alfalfa leaves contained significant amounts of the fat-soluble factor, the first vegetarian source. Eventually, they found it in all the leafy greens they tested. Looking back, McCollum realized why the wheat-fed cows were so much worse off than the corn fed ones:when wheat was processed for the experimental feed, the product included the seeds (the grain) and the chaff (the stems), but no leaves. Corn, on the other hand, was processed with seeds, stems, and leaves together, because of a different harvesting technique. That made two super foods — milk and leafy greens. McCollum’s discovery coincided with the beginning of the boom in food advertising. In newspaper ads and women’s magazines, dairy farmers were quick to cite the scientific proof that milk was necessary for healthy growth. The leafy greens, on the other hand, saw no such industry advocacy. In addition to discovering the first vitamins, Elmer McCollum was also the first scientist to use lab rats for nutritional research. While McCollum was trying to solve his cows’ diet mystery from the bottom up by studying the chemistry of individual foods, across the Atlantic, a Polish scientist named Casimir Funk was studying nutrition from the top down by starting with human disease. Building upon decades of medical research showing that diseases such as scurvy could be cured by diet changes, Funk named this class of maladies the “deficiency diseases.” He theorized that a diet missing certain “special substances [that] we will call vitamines” caused these diseases. He called them vitamines, linking the word vital with the word amine, the scientific term for proteins. McCollum hated the term, because the compound he discovered was not an amine at all. In fact, none of what would later come to be called vitamins are proteins. But the vitamine hypothesis was popular, and McCollum’s discovery was the first isolated food compound shown to prevent deficiency disease. 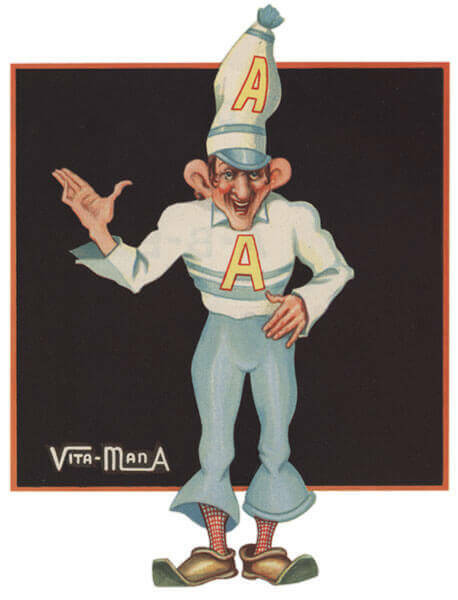 He lost the naming fight, and his growth-promoting factor quickly became known as vitamin A.
Funk identified the second vitamin. He was studying a debilitating disease known as beriberi, which was common in Asia, where the poorest people ate only rice. When rice is harvested, the grains are polished, removing the seeds’ outer layers, and doctors had discovered that eating unpolished rice prevented the disease. Funk tried to find the vitamin hiding in the polished-off parts of the rice. Like McCollum, he found that he could transfer the key component into an extract that contained the key nutrient, later isolated and named vitamin B.
McCollum and Funk could have learned a lot from each other, but before the First World War, it took time for news of breakthroughs to cross the Atlantic. In 1914, they started studying each other’s research. McCollum concluded that Funk’s vitamin was soluble in water, distinct from his fat-soluble vitamin. 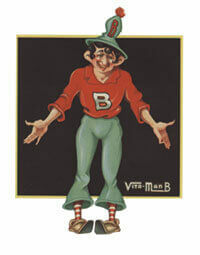 Funk found that vitamin A doesn’t prevent beriberi, but vitamin B does. Although McCollum initially believed that vitamins A and B were the only members of this special group of growth-promoting nutrients, the vitamin concept opened the door for the modern era of nutritional science. Researchers across the country started to study foods, focusing in on other diseases where a dietary link had long been suspected. Cod liver oil helped prevent rickets, a deforming bone disease. Fresh fruits and vegetables cured scurvy. What was hiding in those foods that made them protective against diseases? The hunt was on to find out. Pellagra was a persistent disease of the times, frequently found in orphans and prisoners. It caused scaly sores on the skin, diarrhea, inflammation, and eventually, mental delusions. Convinced that it was linked to diet, one doctor began injecting himself, his wife, and the medical students he supervised with various body fluids of sick patients. Luckily for his volunteers, he was right. The stunt demonstrated that the disease was not contagious. Nutritionists began to pay attention, and soon after, they discovered that a vitamin deficiency was to blame. With more people conducting experiments on nutrition, more discoveries quickly followed. The long-suspected substance that prevents scurvy was named vitamin C. Vitamin B turned out to be a complex of several vitamins, protecting people from both beriberi and pellagra. Building on the work of others, McCollum also isolated vitamin D from cod liver oil. UW–Madison Archives, 9/11/13/1, Box 1. 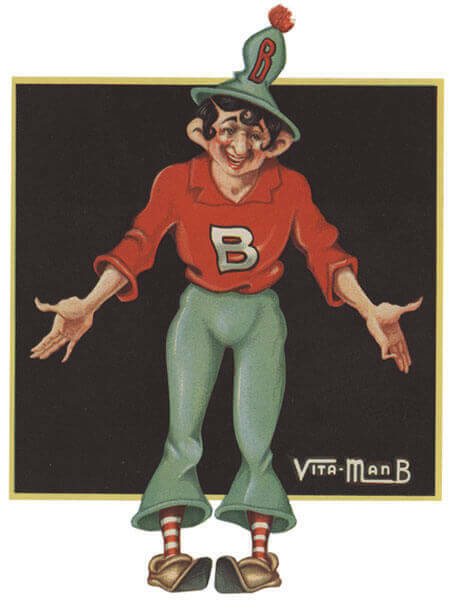 Image used with permission of Phillip Lithographing Co.
As the number of discovered vitamins increased, named largely in alphabetical order, they were still often found in high levels in milk and leafy greens. McCollum began a public health campaign to share what he called “the newer knowledge of nutrition.” He told people that Americans ate too much meat and too much sugar, and that everyone would benefit from a return to simple, healthy food. He described the ideal diet as “lacto-vegetarianism” — with lots of leafy greens and up to a quart of milk a day. More dairy equals more vitamins — music to the ears of Wisconsin’s dairy farmers. 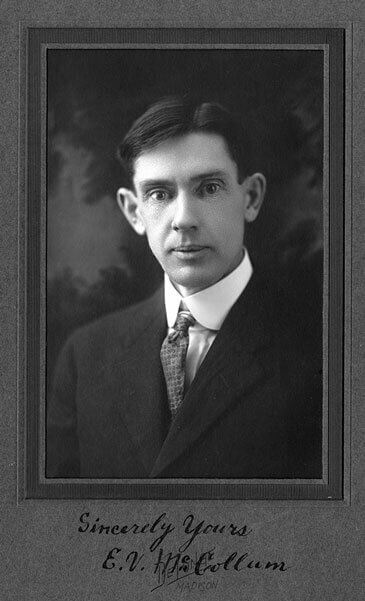 McCollum left the UW in 1917, lured away by an offer from Johns Hopkins, but one of the graduate students he worked with, Harry Steenbock, carried on nutrition experiments in Madison. It wasn’t an easy breakup. Steenbock had expected more credit for the vitamin A discovery, and McCollum had published with Davis as his co-author — a rare feat for a woman in 1913 — and only thanked Steenbock as a lab assistant. Soon, however, Steenbock made a name for himself, discovering a technique for increasing the amount of vitamin D in foods by irradiating them with ultraviolet light. Ten years after vitamins were discovered, he had a patent for the process of fortifying foods. 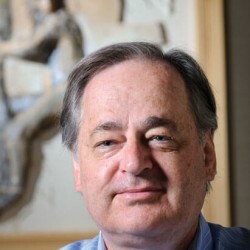 His quest to patent and market his technology led to the establishment of the Wisconsin Alumni Research Foundation. During the ten years between McCollum’s discovery of vitamin A and the commercialization of vitamin D, interest in nutrition exploded among scientists and housewives. Vitamin quickly became a household word, synonymous with promoting healthy growth for children and preventing diseases, even though deficiency diseases were rare for middle-class children whose mothers were targeted by marketing campaigns. Today we still worry about getting our vitamins. How many are enough? Are supplements a good idea or not? But no one even thinks about needing vitamins to prevent beriberi or pellagra or rickets. Thanks to the work of McCollum, Davis, Steenbock, and others, these formerly mysterious deficiency diseases are vanquished in this country. But the scientific pursuit for the healthiest diet — kicked off one hundred years ago at the UW — continues. After reporting this story, Kate Prengaman MA’13 now happily considers banana cream pie a health food. Editor’s note: The reference to “protein-free milk, also known as whey” that appeared in the original version of this story is incorrect. Whey is the watery component of milk that is left after separating the curds, and it does contain protein. We regret the error.